DALLAS – Oct. 30, 2018 – Biophysicist Dr. Michael Rosen – whose research is at the forefront of work revealing the fundamental process of protein phase transitions within the cell – today became UT Southwestern's first Allen Distinguished Investigator. The Allen Distinguished Investigators program supports early stage research with the potential to reinvent entire fields. Each investigator receives $1.5 million over three years. The awards are part of The Paul G. Allen Frontiers Group, a division of the Allen Institute founded by the late philanthropist Paul G. Allen. 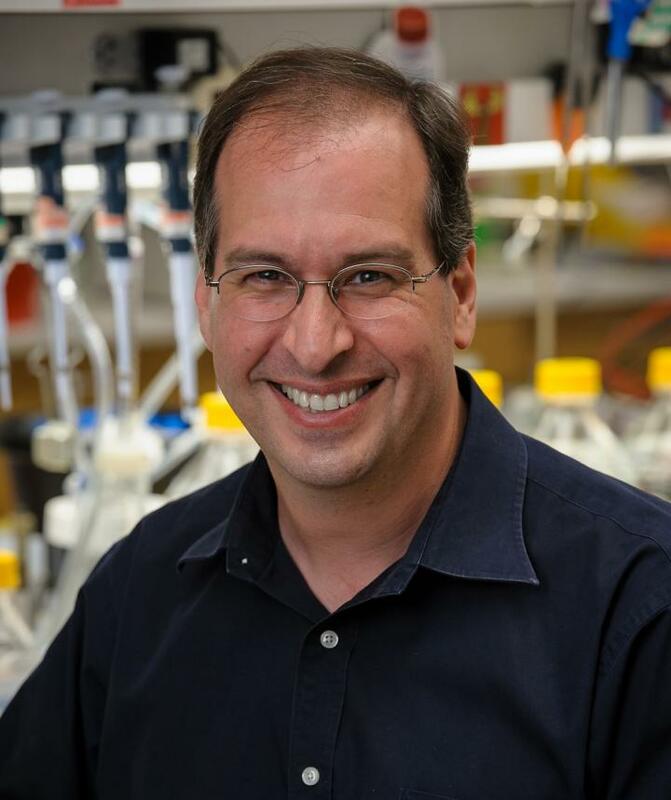 "We are delighted that the Allen Institute has chosen to recognize Mike Rosen's outstanding research in the field of protein phase transitions with this award. His work has revealed how these transitions affect fundamental biological processes ranging from the shape of a cell to signaling in the immune system," said Dr. Dwain Thiele, Interim Executive Vice President for Academic Affairs and Provost, and Dean of UT Southwestern Medical School. Dr. Thiele holds the Jan and Henri Bromberg Chair in Internal Medicine. Dr. Rosen, UT Southwestern's Chair of Biophysics and a Howard Hughes Medical Institute Investigator, will lead a project studying the physical behavior of the nucleus, the cell's DNA-storage compartment. Recent research has found that, much like the separation of oil and vinegar in salad dressing, regions of the nucleus separate into unmixable liquidlike droplets, also known as biomolecular condensates. His project will probe how condensates form, what they look like in three dimensions, and how defects in these mysterious droplets contribute to a rare type of cancer. "It is a tremendous honor to be recognized as an Allen Distinguished Investigator by the Paul G. Allen Foundation's Frontiers Group. The Allen Institute is one of the world's leading scientific philanthropic organizations," said Dr. Rosen, a Professor of Biophysics and a member of the Cecil H. and Ida Green Comprehensive Center for Molecular, Computational, and Systems Biology. "The award will give us the opportunity to move in new directions and take risks in our studies of biomolecular condensates in the cell nucleus." Dr. Rosen said he looks forward to interacting with ADI awardees from this year and previous years, whom he described as "an incredibly accomplished and innovative group." With the 2018 awards, 69 Allen Distinguished Investigators have been appointed since 2010. "This recognition and opportunity would never have been possible without the outstanding graduate students, postdocs, technicians, and collaborators that I have been privileged to work with over the years, and the tremendous support of UT Southwestern. I am deeply grateful to all of them for their passion, ingenuity, and hard work," he added. Dr. Rosen holds the Mar Nell and F. Andrew Bell Distinguished Chair in Biochemistry. His lab uses biophysical techniques to understand the formation, regulation, and functions of biomolecular condensates – cellular compartments that concentrate diverse but specific groups of molecules without the presence of a surrounding membrane. Using those techniques while applying tenets from polymer science, he showed that assembly and disassembly of phase-separated structures can be rapidly controlled by covalent modifications, revealing a key mode of condensate regulation. Broadly, his lab illustrated how complex behaviors of condensates can be reduced to biochemically tractable problems and simple rules. Dr. Rosen received undergraduate degrees in chemistry and chemical engineering from the University of Michigan in 1987. He then spent a year in Dr. Alan Battersby's lab in the Department of Chemistry at the University of Cambridge as a Winston Churchill Foundation Scholar. He received his Ph.D. from Harvard University in 1993 under the direction of Dr. Stuart Schreiber, with whom he studied the structure and function of the FK506 binding protein, FKBP12. He was a Damon Runyon-Walter Winchell postdoctoral fellow in the laboratories of Dr. Tony Pawson and Dr. Lewis Kay at the University of Toronto. Dr. Rosen started his independent laboratory in 1996 in the Cellular Biochemistry and Biophysics Program at the Memorial Sloan Kettering Cancer Center in New York City and arrived at UT Southwestern in 2001. His many honors include an Edith and Peter O'Donnell Award from The Academy of Medicine, Engineering and Science of Texas (2006). Note: To read more and to view three videos about Dr. Rosen's international experiment in collaboration to accelerate this line of research, please see our story "To Woods Hole and Beyond" in In Pursuit – Research at UT Southwestern. UT Southwestern, one of the premier academic medical centers in the nation, integrates pioneering biomedical research with exceptional clinical care and education. The institution's faculty has received six Nobel Prizes, and includes 22 members of the National Academy of Sciences, 17 members of the National Academy of Medicine, and 15 Howard Hughes Medical Institute Investigators. The faculty of more than 2,700 is responsible for groundbreaking medical advances and is committed to translating science-driven research quickly to new clinical treatments. UT Southwestern physicians provide care in about 80 specialties to more than 105,000 hospitalized patients, nearly 370,000 emergency room cases, and oversee approximately 2.4 million outpatient visits a year.